The first thing I noticed about La Nuova Pastelleria was the two signs in front. I suppose it’s not remarkable to have two signs—except that the restaurant’s name is misspelled on one. Somehow these details (or lack thereof) add to the character of anyone’s Neighborhood Restaurant. La Nuova Pastelleria does feel like a neighborhood trattoria—if your neighborhood is Forbes Park. I was trying to imagine the guests over the years. Young stallions named Franco impressing their dates? Ex-pat executives and happy kids eager to taste something familiar? Santuario ladies with Doña hair, post-parlor and post-Mass? All seemed to be present and sharing the same comfortable familiarity with the place—the kind you sink into in any old world restaurant. The dining room was unassuming. Thirty seats and lots of wood. A hexagonal, empty cake display, two glass takeout refrigerators with colorful prepared salads, cured meats, and sliced cheeses, and a view into a bustling kitchen. A little stranger were the floor tiles on the wall, the tabletop paper tissue dispensers, and the SM rubber placemats. Our server arrived promptly, handing us a bubble jet printed menu in a clear restaurant menu book that seems to be required in all Italian restaurants in Manila. Maybe they all have the same guy in the back printing the menus? The service was straightforward and efficient. I inquired about wines. “What wine do you want…red or what,” was the answer from the slightly bewildered server. To my delight, the wine was the nicest surprise of the night. A glass of Terre Palladiane Valpolicella 2004 cost P180. My palate is unfamiliar with most Italian grapes but this blend from Veneto was slightly dry, soft and fruity, nicely balanced, and full enough to compete with the heavy sauces of the meal. We sampled Spinacci Trifolate (P297) as the first course, a sloppy mélange of sautéed spinach with truffle cream in porcini mushroom sauce. While I’ve seen better plating at the Meralco canteen, the taste was decent. The viscous cream sauce with sliced porcini complemented the mildly astringent greens well. Light in texture with a delicate, earthy flavor, the dish was tasty but lacking complexity. 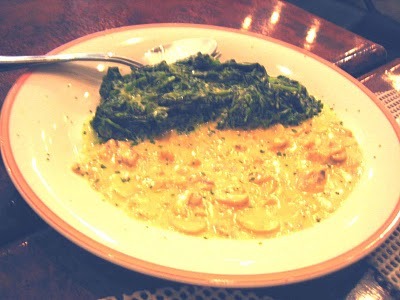 Our second course of Cacciuco alla Livornese (P495) provided a pleasant herb-flavored contrast to the creamy first. 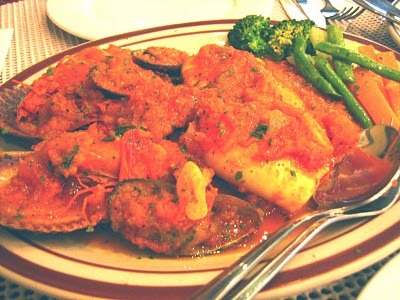 Promoted as “fish and seafood sautéed in thick tomato sauce Livornese style,” the plate that arrived fulfilled its promise with a generous, steaming stew of large squid, scallops, prawns, mussels and filleted white fish. The boiled, buttered vegetable garnish was sort of like adding a naked fluorescent bulb to an otherwise shining dish. We started out with, “wow that looks great, wait…ay, ang pang…” I guess updated plating is not La Nuova Pastelleria’s forte. Every country seems to have a variation of the poor man’s seafood stew—Portugal’s Caldeirada da Marisco and France’s Bouillabaisse, for example. What I like about them is the opportunity to taste unusual, interesting, and exclusively indigenous fish (traditionally the odd fish of the catch that couldn’t be sold at market). While these fish are more difficult to work with and are less desirable commercially, I think they add proprietary uniqueness to any seafood stew. The bada bing in the cacciuco so to speak. While La Nuova Pastelleria’s Cacciuco alla Livornese didn’t offer any of the unusual seafood I craved, for the most part we did enjoy the braised shellfish and tomato chunks in its light, almost broth-like herb-scented tomato base. The squid was a little chewy and the mussels almost beyond their time but the dish was agreeable overall. What you would expect in a simple, hearty tomato seafood stew. Unfortunately, things went a little downhill when the third course arrived. 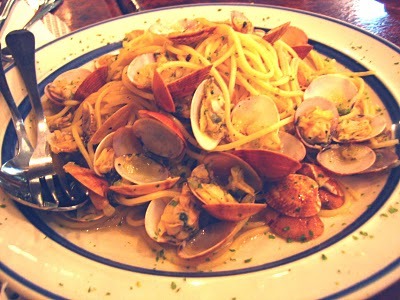 Vongole al Vino Bianco (P374) was more like Vongole al Vino Blando with faint flavor, a lot of spaghetti and no kick. A basic spaghetti with baby clams, olive oil and white wine sauce, this dish reminded me of PAL economy class (no wait, maybe it was canton, I can’t believe PAL would have Vongole much less Vino Bianco). Nonetheless, the Vongole al Vino Bianco was disappointing in flavor and effort, especially for the price. Perhaps it’s only redeeming quality was it looked pretty good. I just wish it tasted as good. When I inquired about desserts the server apologized—I’m not sure for what—but pointed me in the right direction. I was surprised to see a small selection of pastries crammed into one corner of a glass takeout refrigerator. The assortment seemed accidental and uninspired. Perhaps the owner doesn’t place much emphasis on desserts? The assortment included Canonigo, Chocolate Gateau, Pineapple Tarts, Chocolate Cupcakes, Beehives, and some defiant-looking Ensaymadas wrapped in plastic. I couldn’t bring myself to order one and I have to say I can’t fairly judge a cake by its plastic cover. However, it made me wonder why the name of the restaurant is Pastelleria. Thinking about our one experience at La Nuova Pastelleria, indistinguishable is the best word that comes to mind. There was nothing really wrong with it but I can’t pinpoint any real differences in taste from most other independent Italian restaurants in Metro Manila. The food doesn’t seem too many steps greater than what you could make yourself. While I understand restaurant expectations should be relative (the “good for what it is” argument), La Nuova Pastelleria’s higher prices create higher expectations. I think of Amici’s pastas at P150-180 and pizze at P225-250 and wonder, where would I be happier? I’m not sure I would make an effort to get over to La Nuova Pastelleria but I might stop by if I was in the neighborhood. Besides my nasty burn marks, it is still a solid review. I wouldn't expect anything less. Oh my. I am confused, yet I am in strong anticipation now. Now more than ever. Must eat there SOON. Interesting to read your different reviews...makes for a well rounded report :) Looking forward to more! Very interesting post about La Nuova, I like how candidly written it is! I was laughing about the menus! :) I first started going there way back in HS (which, trust me, is a looooong way off!). I no longer frequent it as much but was just there 2 weeks ago and had the truffle cream pasta and porcini risotto shared with a friend. While the risotto was alright, it paled in comparison to the pasta. I LOVE the tartufo pasta (the one with truffle cream). We keep going back for that. Must try the spinach ravioli soon though.